Not only can you monitor your smart lock from anywhere with SmartThings, you can ask Alexa to help without picking up your phone. Find out how to add the Smart Home skill to SmartThings here. There are plenty of compatible “Works with SmartThings” locks to use with voice control including models from including Yale, Kwikset and Schlage, so don’t worry about locking the front door when you have your hands full. 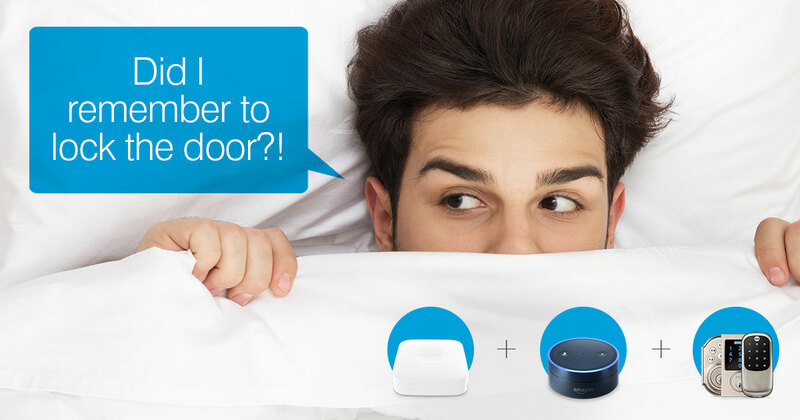 And making sure you’ve secured the door is as easy as asking Alexa, no need to find your phone or get up to check. Use Amazon Echo and SmartThings to lock up your home, save a little time, and rest a little easier knowing peace of mind is just a phrase away.